Quinoa is an amazing nutritious grain from South America. It’s a great source of dietary fibre, higher in protein than other grains and a source of many nutrients including iron. You can substitute it for rice or cous cous as sides for stir-fries, curries, casseroles or use it in place of oats for a porridge or as Ive done below, add it to salad. This salad is suitable for those following a vegan diet or gluten free diet. 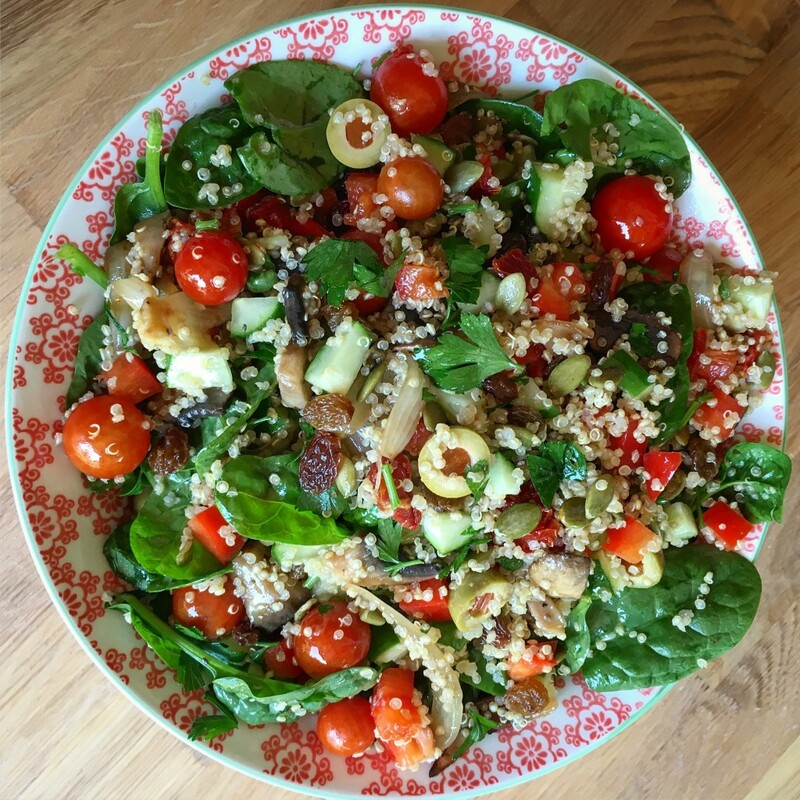 I’ve included a few good sources of plant-based iron including the quinoa, baby spinach, raisins and pumpkin seeds as well as sources of vitamin to to aid absorption e.g. the lemon juice and the fresh tomatoes and capsicum. Heat a medium fry pan on medium-high heat and add the 1 tsp oil. Once heated, add the oinons and pinch of salt and cook for 1-2 minutes, stirring occasionally. Add the mushrooms and cook for a few minutes until the onion goldens and the mushrooms soften. Remove from heat and allow to cool. In a large bowl, add the quinoa and vegetable ingredients and combine. Then add the lemon dressing and mix well to combine. Taste and adjust seasoning as desired. Serve salad next to your favourite protein e.g. tofu, chicken, beef, fish, eggs etc. Leftovers can be stored in the fridge for a few days. be but definitely you are going to a well-known blogger if you aren’t already. you still take care of to stay it sensible. I can’t wait to read far more from you. Hello, its nice piece of writing regarding media print, we all know media is a fantastic source of information. Really very good article and healthy article. Thanks.